The District 14-5A swim meet went pretty much as expected with The Woodlands claiming both the boys and girls crowns. The Highlanders, who are the defending state champions, and the Lady Highlanders, who were runners-up at state in 2004, both excelled as expected en route to winning the team championships. But what might not have been expected was the strong performances of Montgomery County's other two squads competing on Saturday at Klein High School as both Conroe and Oak Ridge turned in solid meets. "I thought we did real well in a tough district," said Conroe coach Steve Montgomery. "It was very exciting." Conroe qualified all six of its relay teams for regionals and also had six individuals finish in the top six to earn a spot at regionals. Leading the way for the Tigers was Sean LeNeave who won both the 200 IM and 500 freestyle events. The junior was one of only two boys competitors at the meet to win two different events. Sean's older brother Patrick also qualified in two events. 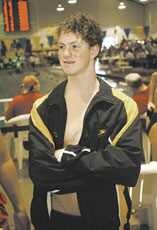 The Conroe senior finished third in the 100 butterfly and also will compete in the 50 free at regionals. For the Tigerettes, four girls qualified in five events. Jesse Sartain will compete in both the 200 and 500 freestyle events at regionals while Sarah Ghazi qualified in the 200 IM, Danielle Sartini in the 100 butterfly and Helen Husbands in the 100 freestyle. Conroe also had several swimmers that just missed out on a trip to San Antonio for the regionals. "We had several that did their best and drop their times, but still would get seventh or eighth and that's tough. We had four or five swimmers that did that," said Montgomery. "That's the whole thing about our district. The Woodlands can enter four people and Klein can enter four and their both very good swimming programs. Only six go, so the odds drop tremendously." One of those teams that was impacted by The Woodlands and Klein's strong performances was Oak Ridge. After years of dominating in Class 4A, the War Eagles got their first taste of a 5A district swimming meet on Saturday and finished sixth on the boys side and fourth on the girls. Still, ORHS coach Mike McCauley was pleased with his squad's performance. "It was very successful," he said. "We had a lot of drops in times. I'm really proud of them all." Oak Ridge qualified all of its relays to regionals and also had one girl and two boys advance. For the Lady War Eagles, Meredith McCarthy qualified in the 50 and 100 freestyle events. Brandon Galownia repeated that feat for the Oak Ridge boys who also had Grant Woodby qualify in the 500 freestyle. "The kids came out and swum their hearts out," said McCauley. "It didn't phase them, they were just ready to fight as they did in 4A. That brought a big smile to my face and I'm proud of those guys."